I posts scrapbook layouts with my challenges. things up a bit, and make a card. Something that I've been doing more often lately. that are in abundance here in the Washington DC area. I love, love, love fall colors, I was inspired by the photo to do a little coloring and make a card using the spice colors of fall. 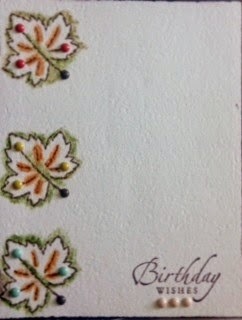 I love fall colors and I especially love that I get to use my big maple leaf punch for fun autumn cards! I went with a layout inspired by the leaves and fall colors in the photo inspiration. These are from our family photo shoot last fall. Now it's your turn! Don't forget to link up your project. you come up with! Have a great week! schöne werke des DT. danke für die inspiration.